Click: Captive Care of the Budgerigar (“Parakeet”), Melopsittacus undulatus; – Budgerigars as Pets – Part I, to read the first part of this article. Budgerigars should be offered a mix of seed based (i.e. Pretty Bird Premium Budgie Diet) and pelleted (i.e. Zu Preem Parakeet Fruit Blend) foods. Sprouting grass (sprout pot), budgerigar treat foods and a small amount of fruit should be offered 2-3 times weekly. Cuttlebone and grit should always be available. Budgerigars live an average of 5-8 years, but sometimes reach age 12 or so. The longevity record is in the neighborhood of 15 years. 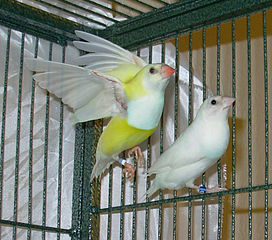 Birds with clipped wings are easiest to train, and hand-raised budgerigars make the best talkers. I’ll cover the details of training in future articles, but in general it is a good idea to position the bird’s cage in a room where you spend a good deal of time, and to talk to your pet quietly at frequent intervals. Actual training sessions should be limited to 10-20 minutes. Finger-training begins by allowing the bird to adjust to the presence of your hand within the cage. Once it accepts your presence, you can gently push against the bird’s stomach, repeating the word “up” as you do so. Eventually you should be able to remove the budgerigar from its cage. Well-adjusted budgerigars genuinely enjoy human companionship and, in fact, may drive you to distraction with their constant play behavior (hanging from your eye-glasses while you are trying to read, for instance!). 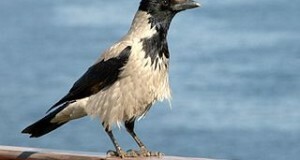 Speaking is largely a matter of repetition – be sure to use words in context, so that your bird will appear to “know what it is talking about” once he or she does start to chatter away. Budgerigars frequently pick up words or sounds on their own, including the calls of wild birds. One kept by my grandparents frustrated my grandfather by continually calling his name in imitation of my grandmother. My slightly deaf grandfather often responded the bird’s call and ignored his wife’s – both were convinced that the budgerigar’s “chuckling” afterwards was purposeful! Parakeets are quick to learn simple tricks (more on that in the future) but bear in mind that their natural behaviors when confronted with new objects or situations are usually well-qualified as “tricks”. Keep them in a stimulating environment and well supplied with toys and you will never want for amusement! Budgerigars are adapted to one of earth’s harshest environments (please see Part I of this article) and are quick to come into breeding condition when times are favorable. In captivity, well-fed and watered, they are nearly always ready to reproduce. In fact, the mere presence of a nest box may induce breeding behavior in a pair or egg-laying in a lone female. I’ll cover breeding details in a future article, please write in if you’d like further information in the meantime. The word budgerigar is derived from the Aboriginal term for “good eating”. I have a Melopsittacus Indulatus and i had her for almost two months now. I finally got her to come to me and put her on my finger but all she does is nibble too much.I see videos where they might stand on your shoulder or do other things but the biting doesnt stop is that common? Also i say her name everyday to her but she doesnt say it back to me,is there a special way of getting them to talk back? Frank Indiviglio here. Thanks very much for your interest in our blog and questions. Male budgerigars are more vocal than females in the wild, and usually learn to speak more quickly in captivity. Females can learn to mimic human speech and other sounds, but it may take a bit of time. Two months is not an unusually long training period…it helps to be consistent, and to provide short “lessons” in a quiet, distraction-free room. You can also try playing a Bird Training CD when you are not at home. Nibbling is usually a form of grooming and communication. All parrots are quite social, and spend a great deal of time in physical contact with their mates. Unless the bird is actually attacking, i.e. trying to hurt you, the nibbling is just an expression of her interest in you. Actually, as budgerigars become increasingly comfortable with their owners, the nibbling, hair-pulling and eyeglass stealing may increase! The attentions of a male that I once kept made it impossible for me to focus on writing when he was out of his cage. Sometimes parrots that are kept singly are so eager for interaction when let out of their cage that it becomes difficult to get them to focus on learning to speak. Keeping the birds in pairs alleviates this. 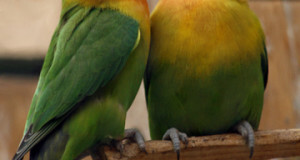 The downside is that paired birds may spend more time communicating with each other than their owners, although males often learn to speak none-the-less. I hope this was useful…please keep me posted on your progress. Thanks.